La Casa De Pope is an ultra modern, newly built home in Costa Diamante. This home has ocean views and a short walk to the beach. It has over 3K sq. 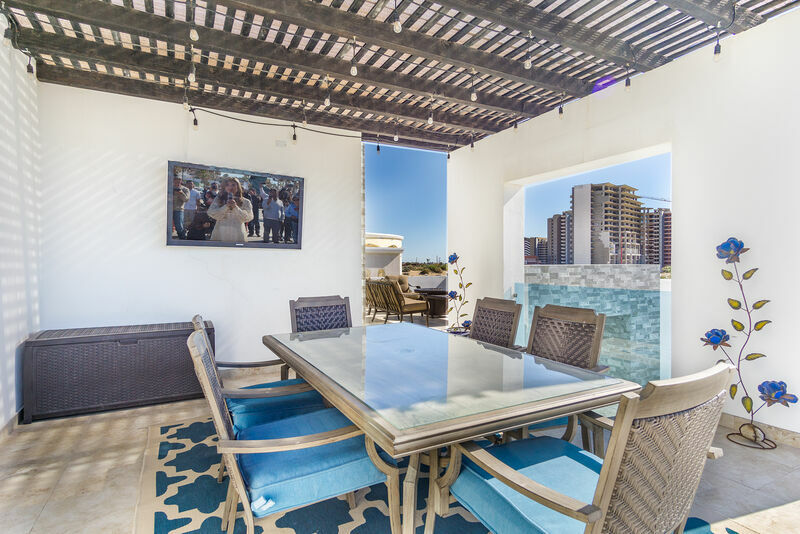 ft of interior space, and a balcony with an outdoor kitchen and 300 degree views of the picturesque Sea of Cortez. All of the amenities of a modern home with satellite TV, surround sound, internet, all smart appliances and televisions, Netflix, and plenty of space for 10 people. The house has 3 bedrooms and 3 ½ bathrooms with ultra modern fixtures. The furniture is high end and custom, with each room having large screen televisions. The master bedroom is done in navy and silver with a vanity to prepare for your evenings out on the town. A huge master bathroom has a double sinks and modern glass shower with a separate water closet. The two bedrooms downstairs are done with gender in mind. One guest room has whitewashed new furniture done in seafoam green and grey touches, with a lovely chair for reading. The other guest room has dark furnishings and burgundy with tan bedding, and an even larger television. All the bedding in this home is high thread count bedding, with more than 4 new hotel luxury pillows for each bed. Both downstairs guest rooms sleep 4 with two queen size beds. There is a fold out commercial grade sofa in the living area with an upgraded memory foam mattress. Casa de Pope provides a portable baby crib for infants . There are additional fold out single beds available all over the house. There is a garage (garage is not for guest use for cars) with full size front new loading washer and dryer available. Directly across from the front door is the community heated pool. To the right of the house is a playground for children. Costa Diamante is a gated, secure community directly on the beach. This house is a one of a kind gem ready to accommodate your large family today. 04/16/19 06:43pm Luis Great location, House is fantastic! 01/01/19 06:23pm Bethzyra House was stunning, great location! Will be staying here again in the future!! !